Many of you will be aware that New Year’s Day is the one day in the year when you can run at two different parkruns on the same day and have both officially recorded. Our later than usual start of 10:30 therefore meant that some of you arrived on the Common today already having run 5k elsewhere – more about that later. Events close to one another will often coordinate their start times to allow people to complete a double. And last year’s establishment of a parkrun in Malmö, at the southern tip of Sweden, created for the first time the exciting possibility of runners combining a run there with one in Copenhagen – two parkruns in two different countries on the same day! 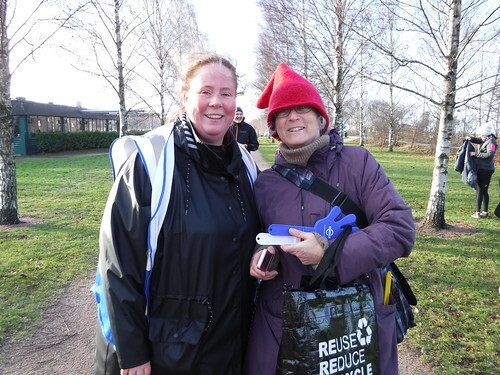 The Denmark–Sweden New Year’s Day double was well publicised in advance, and as such attracted a lot of interest. 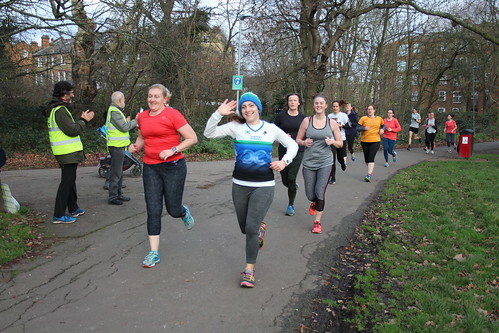 A total of 141 people went over to complete both parkruns, the majority from the UK parkrun tourist crowd. 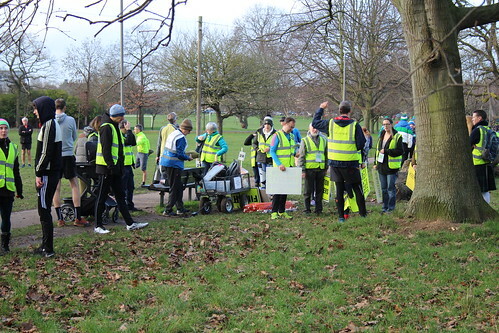 It was well organised too, with a private Facebook being set up by Andy Moore from Peter Pan parkrun in Hull to coordinate meeting up, and members of both event teams joining to offer travel and accommodation tips. 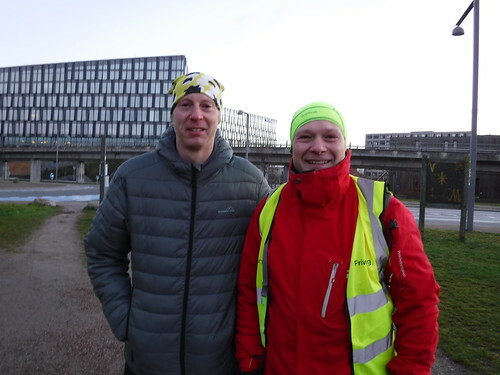 Anders Staffe, a regular at Amager Fælled parkrun, also helped out on the day by acting as a chaperone for those travelling by public transport between the two. The contribution of Andy and Anders to the double was immense, and I am sure I speak for everyone attending that we are thoroughly grateful to them both. Andy and Anders - parkrun tourism legends! 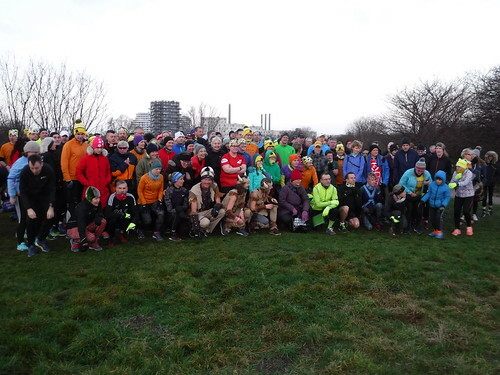 With its first run taking place in May 2009, Amager Fælled parkrun is the 13th oldest parkrun in the world and was the first one set up outside of the UK. It is also the most conveniently located of the 3 Copenhagen parkruns from the point of view of making the trip to Sweden, so it made sense to hold the 9am event here. Set in the middle of a vast area of common land within walking distance of the city centre, Amager Fælled parkrun is a simple to follow two lap course. DR Byen metro station, a 10 minute walk from the start line, is the closest public transport to the event. You can also hire a bike and cycle there - an option that seems to be very popular with locals. The run is pancake flat and the paths used are well maintained, so road shoes are the best option here. There are however no course marshals, and flour is used to indicate turns and the start line. The 160 runners today did not set a new attendance record - that honour is still held by the 500th run, which took place in September last year. However, it came in as a close second. First overall finisher today was Jim Webb in 17:26, and hot on his heels was first female finisher Hannah Oldroyd, crossing the line in 17:53. 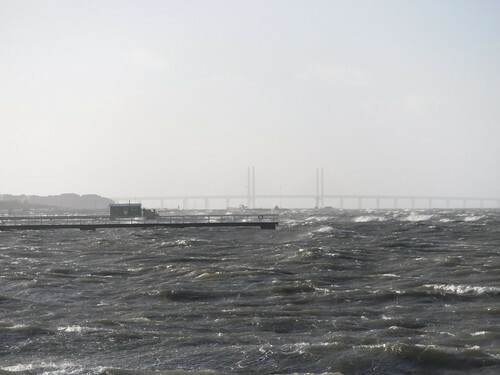 After completion of the first parkrun, next on the order of business was making the trip over to Malmö, which is separated from Copenhagen by the ‎Øresund Strait. The journey between the two cities was simplified in July 2000 by the opening of the ‎Øresund Bridge, a combined railway and motorway bridge that has in recent times been made famous by the Nordic crime TV series The Bridge. I am a big fan of the show, and the possibility of combining two things I love in one trip made doing this New Year’s Day double very appealing for me. People made the journey across the bridge in different ways. Some went over in either hired or shared cars, but most took the train from ‎Ørestad (a couple of stops by metro from DR Byen) straight to Malmö Central station. Some of the quicker finishers combined the 9:45 train with a run from the station to the parkrun at the other end, but most people got the 10:02 and took a short bus ride instead. Don't Forget Your Passport - DFYP! 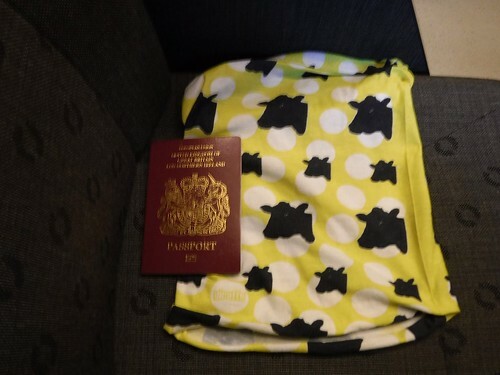 Given that you are crossing a border as part of the journey, you do need to have your passport as you will be checked on the Swedish side (but not on the way to Denmark). The journey time between ‎Ørestad and Malmö is about 40 minutes, and an 11:00 start in Malmö made the journey quite tight. Most of us tourists ended up making a mad dash for the bus on arrival; I can only imagine what locals must have made of about 100 people in yellow bobble hats charging through the station at quarter to 11! But we all made it to the bus OK, and got to Ribersborg Beach in good time for the start. As mentioned previously, Malmö Ribersborg parkrun was only set up last year, and today was its 39th event. The event is a one lap course around the lawns next to Malmö’s main beach, and like Amager Fælled is a pancake flat run for which road shoes are ideal. The attendance of 152 comfortably set a new attendance record, the previous one being 79 at the inaugural. It also represented a huge jump up compared to recent turnouts - the previous Saturday had seen their lowest ever attendance of 12. The course is very scenic, and you have great views of both the Øresund Strait and The Turning Torso as you go round. Today's run, however, was notable for two things. Firstly, there were a few obstacles in the form of boxes of spent firework shells dotted along the paths. They were no doubt used the night before - let's just say that the Scandinavians are keen on their New Year fireworks! Secondly, there was the wind blowing off the sea. We started out by running straight into it, and to say it was vicious is a massive understatement. This is reflected in the times of the first finishers, who as in Copenhagen were Jim Webb and Hannah Oldroyd - they finished in 18:23 and 18:48 respectively. With the second run complete, we all went for fika - a coffee and cake break which is an important part of Swedish culture. 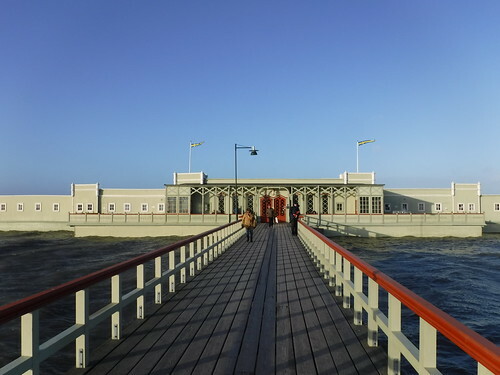 The venue of choice in Malmö is the Ribersborgs Kallbadhus (pictured below), an open-air bathing house which was built in 1898 and is located 300 metres off shore. In addition to having coffee and cake you can also go for a refreshing dip in the sea, but I didn't on this occasion as I had forgotten my swimming trunks - that's my excuse and I'm sticking to it! 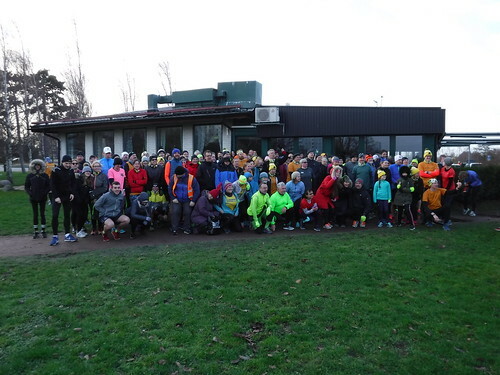 The Denmark-Sweden New Year's Day parkrun double was a fantastic occasion to be part of, and I'd thoroughly recommend doing the trip yourself if you can. It is truly amazing what such a wonderful international organisation makes possible. Today 426 people ran, jogged and walked the course, of whom 79 were first timers and 15 were running their first ever parkrun. 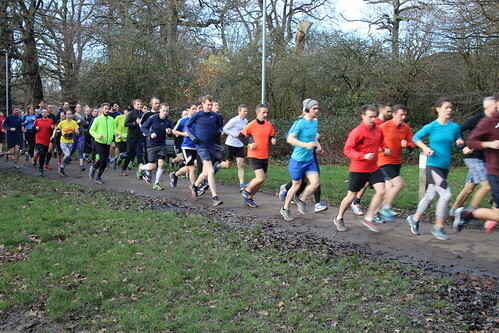 56 recorded new Personal Bests, and representatives of 38 different clubs took part. Of those arriving at the start line at 10:30 today, 46 people (or 11% of the field) had already run an event at 9:00. 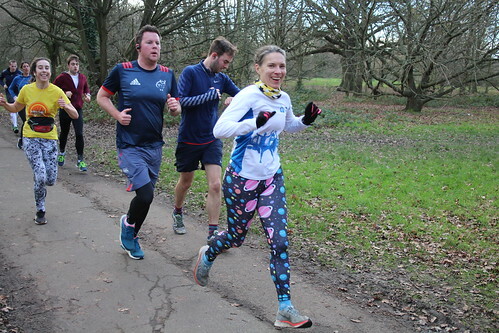 The most popular 9:00 run venue was Peckham Rye with 24 people heading there first, with Riddlesdown being the second most popular with 10 and Beckenham Place in third with 5. In addition, 3 people ran at Richmond and one person came from each of Highbury Fields, Old Deer Park, Lloyd and Bushy. Joshua Pewter (SM25-29) of Herne Hill Harriers was first over the line in 17:12. 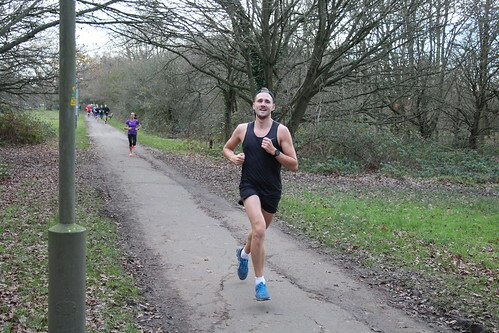 Sam Davey (JM15-17) of Worcester AC was second over the line in 17:24 in his first appearance at Tooting Common parkrun. Lucie Custance (VW35-39) of Clapham Chasers RC was first over the line in a new PB of 17:24. Megan De Silva (VW35-39) of Ranelagh Harriers was second over the line in 19:23. Lara Langston (SW25-29) of Herne Hill Harriers was third over the line in a new PB of 19:41. Congratulations to Abigail Hermon and Jasmine Sandalli, both of whom ran their 100th parkrun with us today. - Our junior stars today were Dylan Sweet, Elouise Greatrex, Lydia Mycroft and Coco Green, achieving as they did new bests of 19:45, 23:56, 35:32 and 24:35 respectively. - Ashley Wilkie had perfect vision today as he came home in an amazing 20:20. 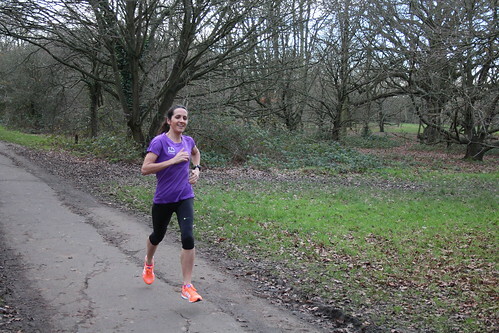 - Clapham Chaser Joanne Hinsley continued her excellent recent form by recording her fourth successive course PB, this improving on her time from before Christmas by 32 seconds to 25:14. - Clapham PiONEERs Michael Wiggins and Tiphaine Le Bian were obviously inspired by their 9am run at Peckham Rye as they beat their previous records by 14 seconds and 58 seconds to get 18:01 and 24:57 respectively. 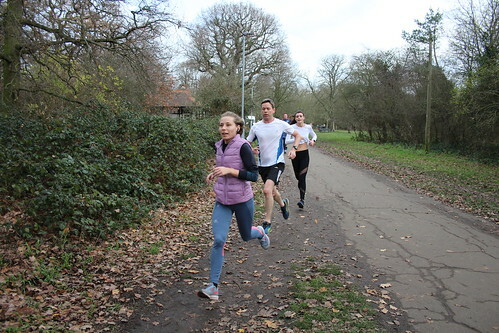 - Clapham Common parkrun Co-Event Director Jennifer Woolgar ran with us for the first time since last July and improved her previous course best by 26 seconds to get 23:49. Welcome back, Jennifer! See you all again on Saturday for what will no doubt be a busy run – and Happy New Year! This entry was posted in Run Reports and tagged international, Mark Shotton, new year, tourism by tootingcommonoffice. Bookmark the permalink.